OPUS Archives and Research Center is proud to announce our fall RoundTable featuring Dr. Christine Downing, whose collection is housed at and available for research at OPUS. In this presentation, Dr. Christine Downing will interweave her own family history, her engagement with Freud and Jung, and their engagement with each other. Dr. Downing has selected this as a perfect choice for her OPUS Mythological RoundTable, as it will touch on connections between the personal and professional materials included in her collection. Dr. Christine Downing helped to develop and is a core faculty member in Pacifica Graduate Institute’s Mythological Studies program. Over her career, Dr. Downing has made significant scholarly contributions to the fields of Religious Studies, Mythology, and Gender Studies through a unique blending of rigorous scholarly work with the personal voice of biographical writing and self-reflection. She earned her undergraduate degree in literature from Swarthmore College and her Ph.D. in Religion and Culture from Drew University, where she was the first woman to receive a doctorate. She was also appointed the first woman president of the American Academy of Religion in 1974. Dr. Downing is Professor Emeritus in Religious Studies at San Diego State University, where she taught for almost twenty years. She has also taught at the San Diego campus of the California School of Professional Psychology and at the C.G. Jung Institute in Zurich. Dr. Downing has published and edited many books, including The Goddess: Mythological Images of the Feminine. Dr. Downing’s collection at OPUS Archives and Research Center includes a rich array of research materials, lecture notes, manuscripts, and personal memorabilia, letters, and photographs. Each year, OPUS awards The Christine Downing Dissertation Fellowship (CDDF) grant to graduate-level students in the fields of depth psychology and mythology to utilize OPUS’ collections in their dissertation research. 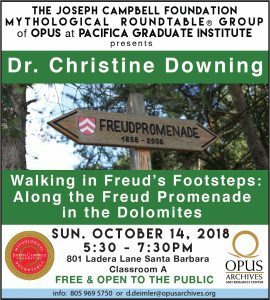 RSVP for Dr. Christine Downing "Walking in Freud's Footsteps: Along the Freud Promenade in the Dolomites" at OPUS to add comments!